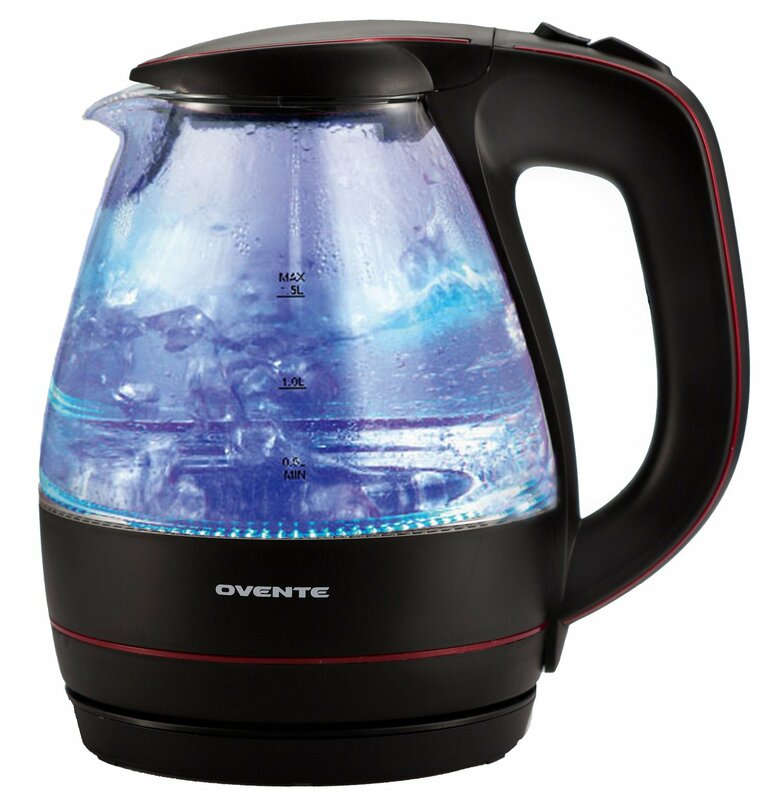 Color: Black | Package Quantity: 1 The Ovente KG83B Black is a high class glass designed electric kettle that looks great on any kitchen or countertops. With 1.5 liter water capacity and 1100-watt of power -- this electric kettle can quickly bring water to a rolling boil. It is proven to be 85 percent more efficient than stovetop kettle that can reduce your daily electricity use. This kettle lifts from the corded base for a cordless filling, pouring and graceful serving. The kettle has a concealed water heating element, so there is no build-up of objectionable mineral deposits, flip-back lid for convenient filling or cleaning, a /washable spout filter to ensure the purest results and durable and stain resistant high borosilicate glass body. For safety purposes, this kettle is equipped with automatic shut-off, boil-dry protection, secure locking lid, power on indicator light, cool touch button and comfortable stay- cool handle. Non-slip 360-degree swivel power base for right and left hand use with a 30-inch cord that wraps neatly into the base for easy storage. Kettle approximately measures 8 x 6 x 9.3 Inch and comes with 1-year limited manufacturer warranty. To use the kettle, simply fill it with water at the sink up to desired amount using the water-level indicator, return the kettle to its 360-degree swivel power base, put it in and push the steam switch button down. This kettle heats fast, approximately 5-6 minutes (at maximum level) and delivers boiling water almost instantly, in a matter of minutes hot water will be ready to use for instant coffee, tea, hot cereal, oatmeal or even a box of macaroni. For more information about proper handling and cleaning of kettle Please refer to the instruction manual.